Clara will not be daunted. Her life will not end when her beloved husband dies too young. She will become a second mother to the children who live away from home at an early age in order to visit a rather special school. When life becomes desperate for a particular class of disabled children growing up in Nazi Germany she takes a few risks. Is her ultimate faith in the goodness of human beings a fatal flaw that leads to her tragedy or is her story actually one of hope? I almost renamed it Flowers on the Table. I wonder whether you can work out why? You'll need to read the story, of course, and you won't get to that bit for a while. I won't give any spoilers here but there may be some elsewhere on the site. Read with care! I've since taken the decision that I don't need to do that. This cover makes that point. 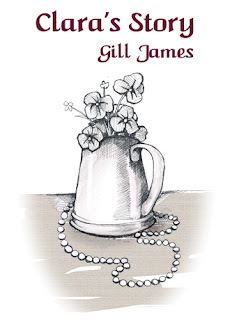 The flowers on the table and the pearls are important in the story, as one would expect.